The entire first level of the IU Auditorium was filled with dancing and swaying attendees Saturday night for the 23rd annual Potpourri of the Arts. The performance, organized by the African American Arts Institute, is a collaboration between the institute’s three organizations — IU Soul Revue, the African American Dance Company and the African American Ensemble. While each group had its own individual performance, Saturday night’s event opened and closed with numbers featuring all three organizations. Childs, a sophomore, said being able to contribute to the music and dance representation of African Americans on campus in her own way is important to her. Potpourri of the Arts began with a speech by Charles Sykes, the director of the institute. He said as he walked into the building, he saw a number of people he recognized as alumni of the institute. He asked them to raise their hands as they sat in the audience. “Thank you for laying the foundation for the students who are going to be performing tonight,” Sykes said. He spoke about the importance of the institute as a place for students to express their creativity and connect with their culture. According to the brochure for the event, the IU Soul Revue was the first popular music ensemble in the country to be offered for academic credit. 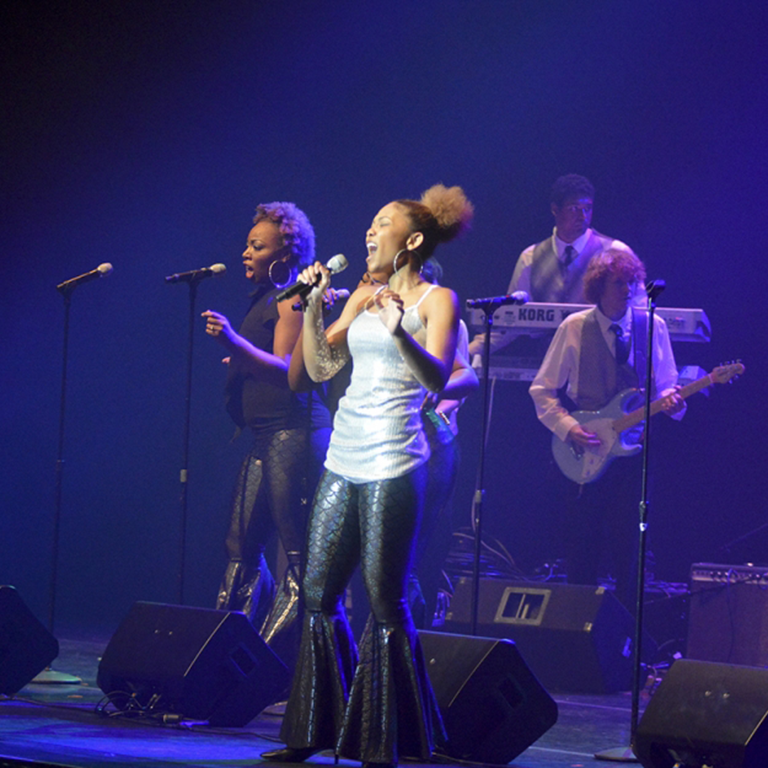 The Revue performed pieces varying from Etta James’ “At Last” to Earth, Wind & Fire’s “September” as clips from the show Soul Train played in the background. Professor Crystal Taliefero stood in the center of it all, directing vocalists and instrumentalists alike. When a musician’s turn for a solo came their solo, Taliefero responded with dance moves, a sort of conversation between artists. As songs progressed, she ad-libbed into a microphone, energizing the crowd. The African American Dance Company performed pieces about liberation and freedom. It featured a spoken word piece about Christopher Columbus, slavery and the colonization of the Americas. At one point, a poem by Langston Hughes played in the background. The poem talked about America’s identity and the true meaning of freedom. The final group to take the stage was the African American Choral Ensemble. Directed by Raymond Wise, a professor of practice in the Department of African American and African Diaspora Studies, the group sang religious tunes, some of which were composed by the director himself. Wise asked people to turn to the person sitting next to them and tell them something could not discover just by looking at them. This, Wise said, was a message he wanted people to take away from the performance. “We might realize we all need love, acceptance and forgiveness,” Wise said. As the chorus swung in tandem, Wise encouraged the audience members to get out of their seats and participate. He playfully reminded the not-so-musically talented audience members that swaying happens on beats one and three, and clapping is reserved for beats two and four. Wise said he wanted people to know regardless of current events, his music should show them there is hope. He said at its core, African American music has always been about hope. He said he spent the summer pondering what he could do to mend the cracks he saw forming in society and the division our country was experiencing. “And then it came to me: ‘Do what you do’,” Wise said.